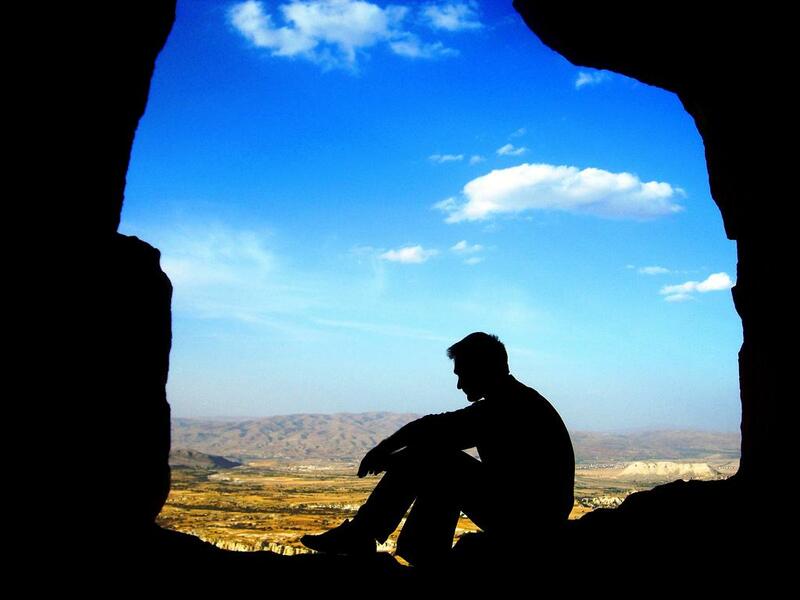 There was once a man in a cave, he was in pain and felt alone. He felt that no one truly understood what he was going through, he felt overwhelmed by all that he had to face out there in the world. He questioned the decisions he had made in the past and felt very unsure about making any decisions for the future. Life hadn’t gone how he thought it would and sometimes the only place that he felt safe was back in his cave. His cave, even though it was dark and sometimes lonely provided him with solace and the time, the space, the quiet, that he needed to think through all that was going on. He often felt guilty wanting to spend time in his cave because there were people who wanted him out in their world, pulling him back when it really wasn’t what he wanted or needed at that moment. The thing about this man, was he was very wise, he was smart and intelligent and he knew what he needed to nourish himself in times of difficulty and sometimes that was time in his cave. He was brave to ask for it and even braver to just take it when he knew it was a must, something he had to do for himself. Now his cave certainly provided him with safety and comfort and it definitely gave him the space he craved but in those times of being on his own, focusing on his problems, feeling his pain, he would often forget about the things outside his cave that bought him joy. In all the darkness, he could easily forget about the light, the sun rising, the warmth on his face, the trees moving in the wind and other simple pleasures that nourished him deeply just outside his cave. At the door of this man’s cave sat a woman. This woman loved him very much. She wanted the best for him, she wanted him to see himself how she saw him. She was a very kind woman, full of love and gratitude and eventually patience. She realised that if she was to truly love this man in the way that he needed she would go on living her life yet every day return to the door of her beloved’s cave just in case today was the day he felt ready to come back to the world. Each day, when this woman went to sleep, she said a prayer for the man in the cave. She prayed for him to find peace in his life, she prayed for him to feel the love of the people around him and she prayed that he would find the courage to do and be whoever he needed to be to be truly happy again. Loving another in the way they wanted to be loved can sometimes be challenging. Loving ourselves first, before we love another, is the path to true fulfilment, because as we sacrifice ourselves, we sacrifice the quality of the love we are able to give. Next articleUncategorizedBreak that board, WOOP, WOOP!